JCH Maths Exam Paper Solutions (Containing Academic Years 2018, 2017, 2016 & 2015). 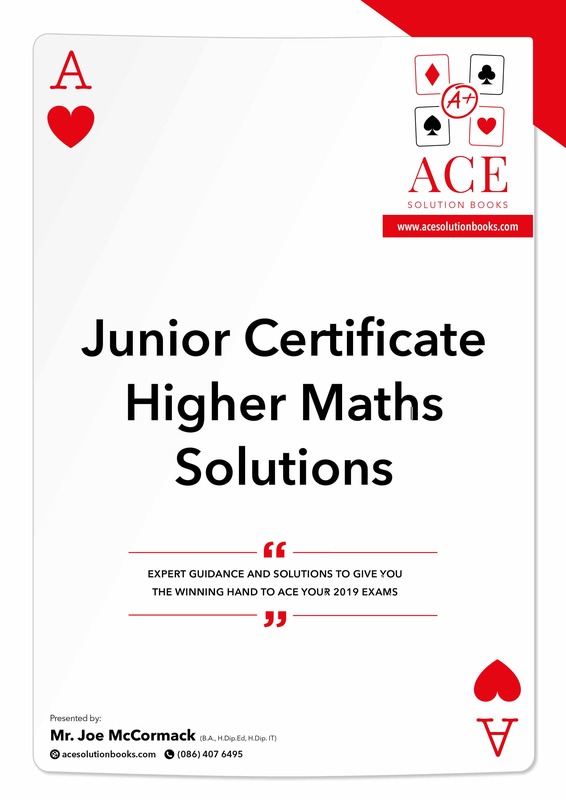 These books contain clear and comprehensive solutions to the Junior Certificate Higher Exam Paper Questions for the last four years (2018, 2017, 2016 and 2015). The 2014, 2013 and 2012 solutions are also available to download and view on any device and can be added to your cart at checkout later if you wish. The unique handwritten solutions are easy to understand for the weaker student but will also provide the high flyer with the skills to hit the “H1” grade. There is one hundred and fifty eight pages of the best notes in each book making it a competitive production at this price point. 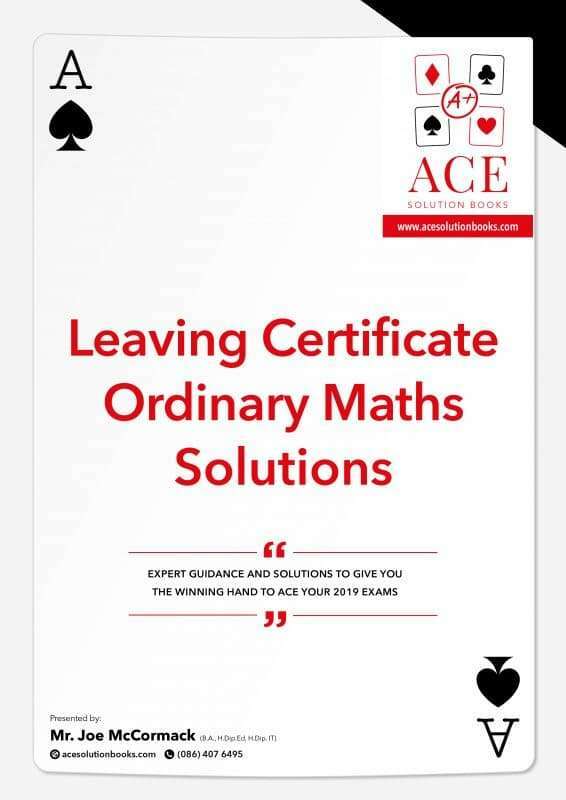 Each book contains the most detailed solutions of any Maths book on the market in Ireland and sets out every single line of the solution (step by step) with notes explaining the Maths behind them. The solutions encompass all topics on the course including Algebra, Geometry, Probability, Statistics, Trigonometry, Area and Volume, Enlargements, etc.. They also give an insight into the marking scheme of each paper. Students who regularly use these books negate the need to spend hundreds of Euro’s on tuition, as many parents have commented to me over the years. Students can easily follow the stepped solutions on their own and subsequently learn how to apply it to a similar styled exam question later. The most efficient way for a student to use the book is to try each question part for themselves first and then subsequently refer to my solution to see where they have gone right or wrong; hence the student is always ‘learning by doing’. When you’re stuck on a maths question over the weekend, rather than having to wait for the teacher to explain it, you can see how it’s done in Joe’s book. The book was really helpful. It helped me not to panic – sometimes I’d see a question and think “oh my God” but then when you read the explanation and the solution it makes you realise it’s actually easier than you think. I love how neat it was too! It really helped me in the run up to the exams in particular when I had all the information, but just wasn’t sure how it apply it to the questions. I was delighted to get an A in Maths. He got his ‘A’ thankfully! I got your Maths Solutions for honours Maths for my son last year and he found it a brilliant help. He got his ‘A’ thankfully! I used Joe’s Maths Exam Papers Solutions Books for both my Junior Cert and Leaving Cert. They were an unbelievable help to me as everything is perfectly explained so simply! I found that in Maths text books everything was dragged out and made way more confusing but with these books I could always figure out the methods quickly. These books really got me through both the Junior and leaving with as little stress as possible! A brilliant way to learn in my opinion. I’m now in my second year doing general nursing in DCU and loving it! Joe was a great help in getting me to where I am now. Thank you. Amy. Totally agree with Gavin Duffy. My daughter used your book for her Junior Cert two years ago and found it of great benefit. Just ordered a set for Leaving Cert. Looking forward to receiving them. Keep up the great work Joe. I found Joe’s Maths books very helpful when I was studying for the leaving cert. I was struggling with Higher level Maths until I bought Joe’s books and from then on, my grades started to improve. I’m glad to say that his books helped me get the Maths requirement I needed for my course Business Analytics in DIT. Your books are fab. I am a visual learner and bought the LC ordinary level Maths book last week for my 17 year old boy. He is very happy that the answers are handwritten rather than typed – much easier to read and follow. My son was averaging 37% in honours maths, I read about Joe’s book on FB & decided to try it. I am pleased to say he got a C today in his junior cert. He was thrilled & said the book was a great help to him. It helped understand by explaining it in a simpler way, thanks Joe. Joe’s solution book came in extremely useful towards the end of 6th year, when much of our focus was on exam papers. The step by step guides using basic vocabulary made it easier to understand the often complex asked questions. We were also able to see how much marks were awarded for each question part and how to break down each question. We found these solution books invaluable as there became less and less time available to look through textbooks for answers. 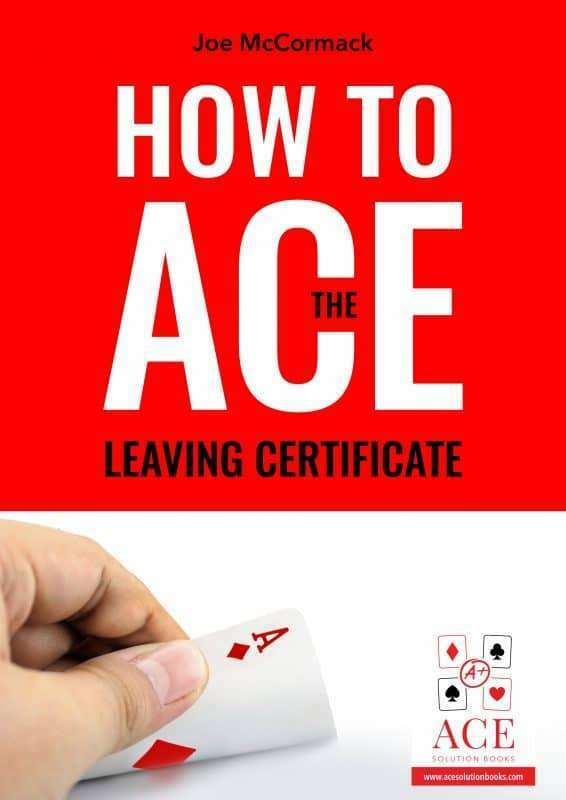 Joe, I have just finished reading your book “How to ACE the Leaving Certificate” for ALL subjects. I think it is brilliantly researched and you combine this very well with your wide experience in the fields of teaching and learning. The book presents lots of valuable tips, approaches and advice for students and parents – on an extensive range of scenarios relating to study and exams-which can be at all levels including PLC and third level. Congratulations on your effort and on getting it published! Very readable and practical. Will definitely recommend it. Good luck with your endeavours! As a student, I loved maths but as a parent I’d been hearing so much about this dreaded new “Project Maths” that when my daughter started secondary school I thought my long forgotten knowledge would be of no use to her. Then I found Joe’s solution book. It’s a simple idea (always the best) – provide the answers to the questions – but for me it was everything I needed to help my daughter i.e. step by step solutions to all the past papers. Using this book along with a blank set of papers ,we are taking it topic by topic to figure out where she’s struggling and then working through each question until she feels confident. The solutions are so detailed that I find it very easy to follow and explain. I would highly recommend this book to all students and parents. Throughout my final year in school I found myself flicking through many pages in my maths book looking for notes, proofs and formulas. When I got Joe’s Maths solutions book, I could finally relax knowing that if I needed to look up a solution, it was easy to find in his book. Joe’s book is clear and easy to read and I don’t think I’ve had a book similar which was so organised and included highly detailed solutions. Overall, the key notes in the book helped me a lot with my Leaving Cert Maths course. Joe’s exam paper solution books are worth getting for your children. My son did Ordinary level maths and his friend did higher. Both kids found the books a huge help as they are written clear and concise. From a parent’s view I found Joe’s Facebook page extremely useful. He answers your questions promptly and is very helpful. I learned more about exams, college applications etc from Joe’s page than anywhere else. If every teacher took as much interest in their students as Joe does maths would not be an issue. Joe McCormack’s ‘Project Maths: Exam Paper Solutions'(Ord. Level) has been a real find!! Joe has included sample maths questions from right across the Maths Curriculum and his answers are written in a clear and logical way. At a very stressful and pressurised time in my life (Leaving Cert.!! ), Joe’s book has been a real support for me. As the Project Maths curriculum is so new, there are very few resources upon which the present day Leaving Cert students can draw. Therefore, this book is worth its weight in gold!! Thank you Joe! I purchased the Project Maths Solution Book for my son who is currently preparing for his leaving certificate this June. He is constantly referring back to it and it has become a very important tool for him in all aspects of maths. 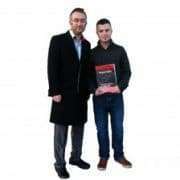 I recently met with his maths teacher who said the book has played an important role in his progression. I’m delighted and such good value also. I think all students would benefit from this book. Thanks Joe; my daughter Kelly finds your book brilliant & was delighted when I came home from work yesterday with this printed out for her. She said there are codes that you can enter on sites which will give you answers but not in as much detail or step by step like you do. She brought it up to her room straight away and worked on it. Joe, thanks for much for producing the JC Higher Level past Maths papers all in one place. I found the solutions really easy to read and understand. There were a couple of parts of the course I needed to brush up on and now I have them all sorted. They are a brilliant study aid. I found Joe’s Solution book to be helpful and gave a clear step by step process of how to answer the different questions and helped to highlight the skills I needed to help me get a H4 in LC higher level Maths. I always liked Maths as a subject, but when they introduced ‘Project Maths’, I found it very challenging. I was determined to keep doing HL. A friend of mine then recommended Joe McCormack’s Project Maths Solution Book to me. Joe’s approach in his book got me the grade (H3) I needed and his support and encouragement over the past year was excellent. I am now looking forward to studying Law and French in UCC. For anyone hoping to do HL maths I can’t recommend Joe’s book enough with its straight forward approach to solutions. Thanks again Joe and the very best of luck to all those doing the LC next year. All the hard work does pay off! 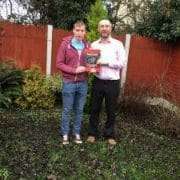 Previously, one of my Maths students, Timmy Lennon from Navan, Co. Meath found my Leaving Certificate Higher Level book extremely useful in preparation for his Maths exam. He went on to ace a highly coveted “A1” grade (Now a “H1”) in Maths. This put him in the top 5.2% of students in the country for his year. Timmy is now studying to be an Actuary at Dublin City University (DCU) having attained 520 points in his Leaving Certificate. See below for a picture of Timmy and I celebrating his success. The book was a brilliant study aid. It helped me understand some of the mistakes I was making. It was a great resource when going through the Maths past exam papers. I can safely say ACE solutions helped me gain a ‘H1’ in L.C. higher level Maths. 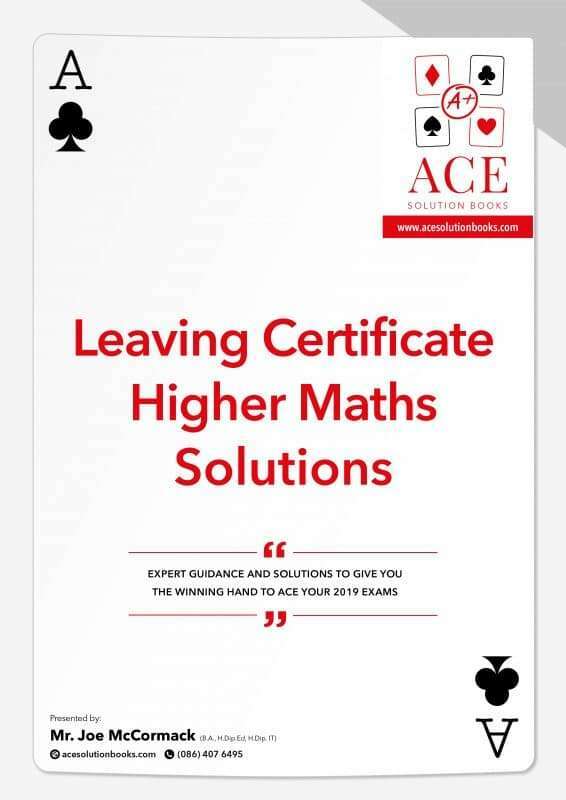 Another of my talented Maths students, Jack Byrne from Trim, Co. Meath extensively used my Solutions Book in preparation for his Leaving Certificate Higher Level Maths exam. He went on to score an impressive 585 points in his Leaving Certificate. Jack was one of two students in Co. Meath to win a scholarship to Trinity College Dublin, where he is now studying General Science. Last Summer, Jack achieved a brilliant 85% (first class honours) in his end of year college Maths Exams. Another star sent on the road to success! See below for pictures of Jack and I. My son thought it was a good book and found it very useful for studying. He will continue to make use of it until his exams. I found the written explanations beside the solutions to be really useful, as they helped me understand fully how to do the question. The procedure in which the answer was done was really simple and made it a lot easier to understand and i was soon able to do the exam questions myself without any help. It also made doing a timed practice exam a lot quicker as I could flick between solutions when correcting.